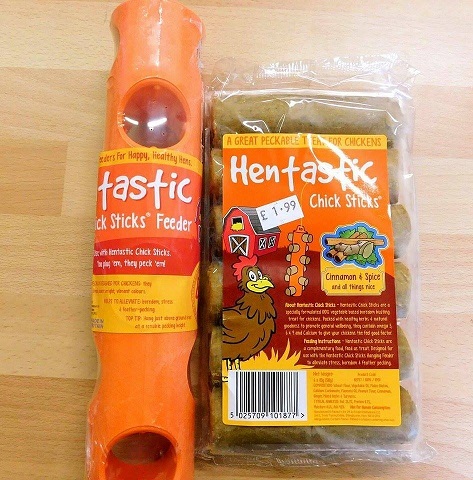 Hentastic Chick Sticks are a specially formulated 100% vegetable based boredom busting treats for chickens. Packed with healthy herbs & natural goodness to promote general well-being, they contain omega 3, 6 & 9 and Calcium to give your chickens the feel good factor. 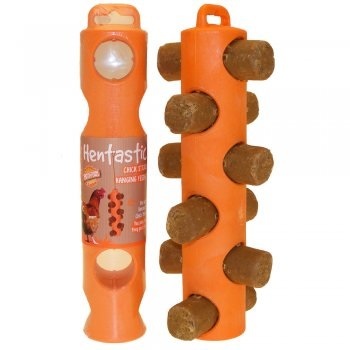 Hentastic Chick Sticks are a specially formulated 100% vegetable based boredom busting treats for chickens. Packed with healthy herbs & natural goodness to promote general well-being, medicine they contain omega 3, 6 & 9 and Calcium to give your chickens the feel good factor. Hentastic Chick Sticks are a complimentary food, feed as a treat. Designed for use with the Hentastic Chick Sticks Hanging Feeder to alleviate stress, boredom & feather pecking. Wheat Flour, Vegetable Oil, Maize Gluten, Calcium Carbonate, Flaxseed Oil, Peanut Flour, Cinnamon, Ginger, Mixed Herbs & Tumeric.